I am so excited about these updates! 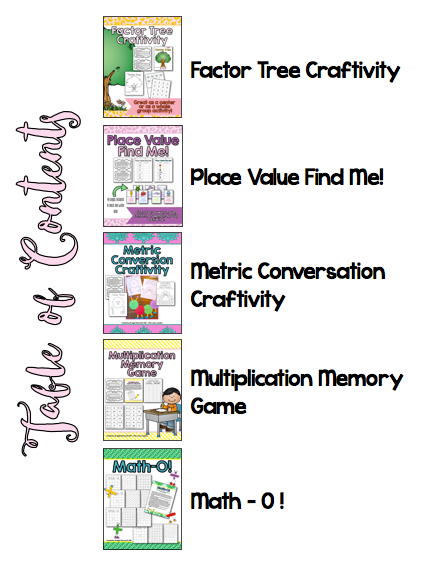 Every once in a while you need a craftivity in math, right!? I know I always need a little break from pure content to do something that is content - related...with a bit of fun! If you already own these items, just go to TpT to redownload the new version! You don't have to purchase it again! :) Yay! 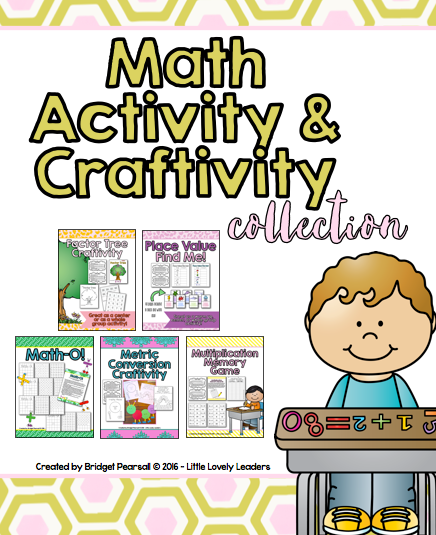 You can purchase the bundle of all of the math activities together, or you can purchase the activities separately, as needed :) The table of contents below goes through all of the items in the bundle (all are also available separately). 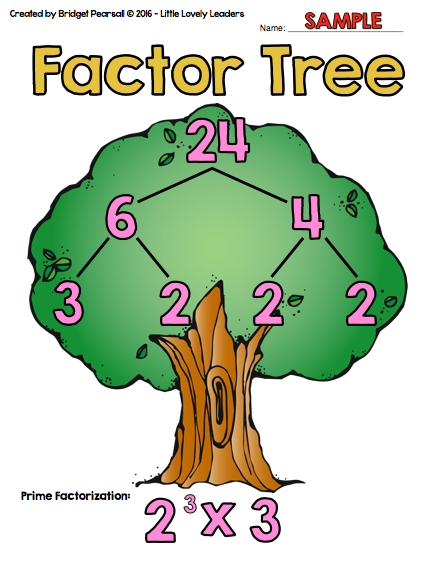 In the Factor Tree Craftivity, students will use given numbers they cut out to color and create their own factor tree, also giving the prime factorization. This could make a really fun center, which is something I really like about this project! I used this at a center in my class for a week. The students worked on it for about 10-15 minutes per day that week. 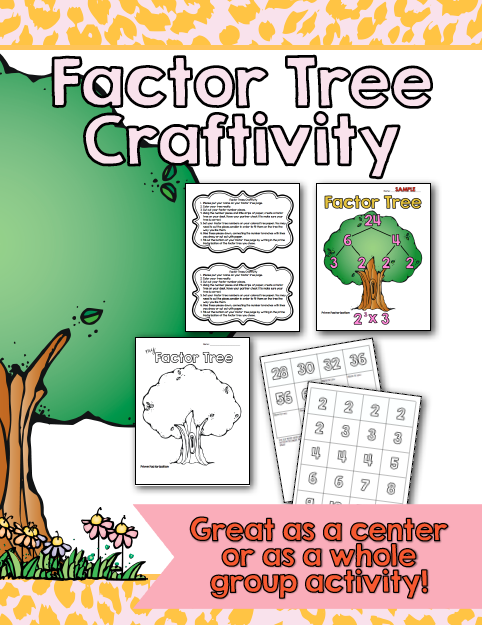 I was able to collect it at the end of the week, giving me a quick and easy assessment of their prime factorization, and a really cute craft to bring home for their parents! 2. 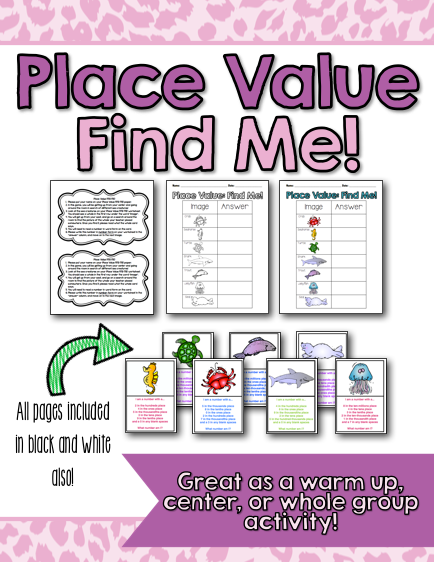 Place Value Find Me! This is one of my favorites! I use this every year, guaranteed! This activity is very similar to what you would normally see labeled as a "write the room" activity. I did not want to call it that, because you can also simply sit the cards at a center so that the kids can fill out their answers there, rather than walking around the room. 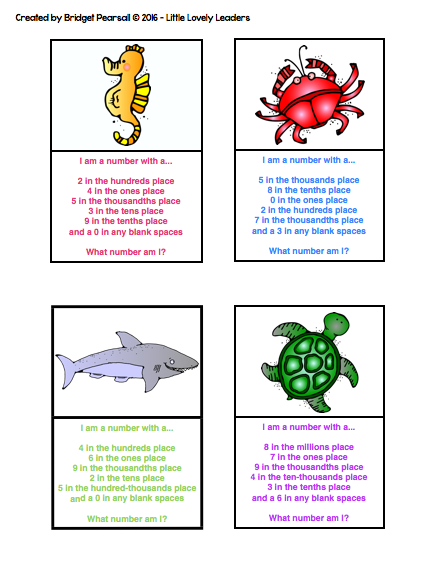 To complete this activity, students simply follow the place value clues given on their card to create a number (putting all of the numbers in their correct place value locations will create the overall, larger number = the answer). Students put their answer on the line next to the animal that matches the animal on the clue card...and that's it!! Gotta make sure the kids know which place is which, right!? 3. 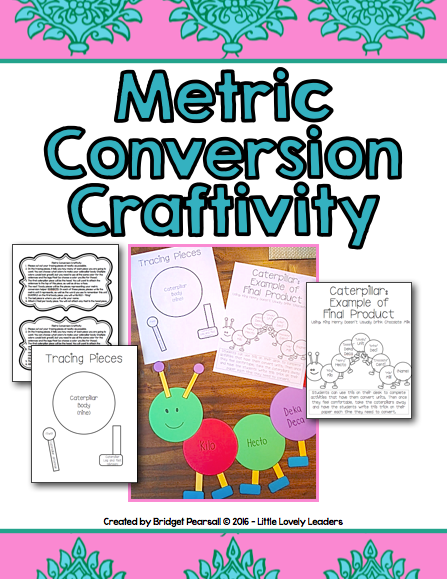 Metric Conversion Craftivity and Useful Tool! Hm...I might have lied before when I said Place Value Find Me! was my favorite....this one might take the cake! You have probably all heard of or taught something the same as, or similar to, King Henry Died Unusually Drinking Chocolate Milk when you teach the metric system and its conversions. 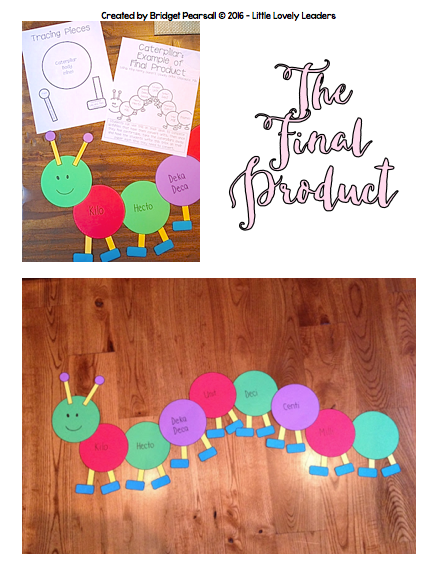 The kids love creating this cute little caterpillar in class, and then using it to help them with their conversions. Eventually, students are able to draw the caterpillar on their own and they don't require the actual craft anymore - but it's a great way to get them started and commit the idea to memory before having them do it on their own. This one is just fun! 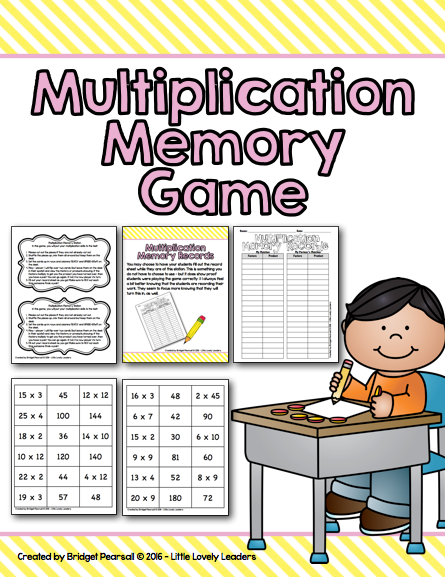 :) It is just like it sounds - a multiplication memory game! Match the multiplication expression to its product and that's it! 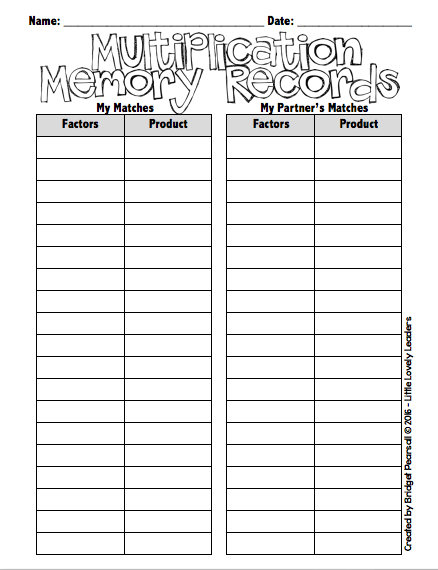 Have your students keep their matches on their record sheet to make sure they are being held accountable for what they are doing while they play the game. They even keep track of their partner's matches. 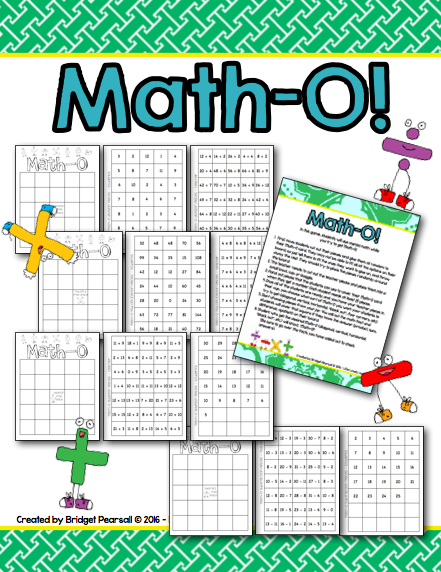 This is a pack of 4 types of math BINGO! Multiplication, division, addition, and subtraction are all included! I love this game at the beginning of the year because I encourage the kids to practice their mental math with these simple expressions. If you are interested in four of the five of these activities, make sure you just purchase the bundle because it will save you money! :) Let me know if you have any questions! Enjoy! I have had a lot of e-mails and Instagram messages recently regarding my post showing my bulletin board. Blue color scheme = FREE! This was not something I thought up completely on my own - we were asked to display this sort of data in rubric form on our boards by our district and their new Learning Goals and Scales initiative. At first, I was not a fan.... another thing to do, right!? 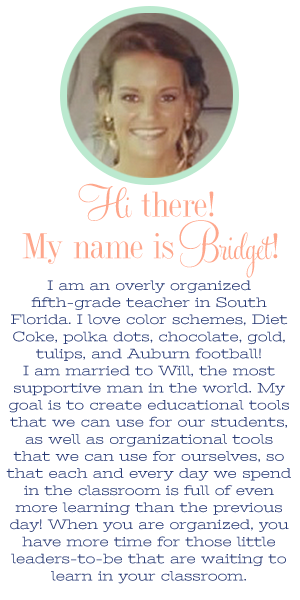 However, I have seen it work in my classroom, so when you all asked me about it, I knew I had to share it! The best part is, I made it a FREEBIE! :) Yay! So, let's take a look at the photo again. 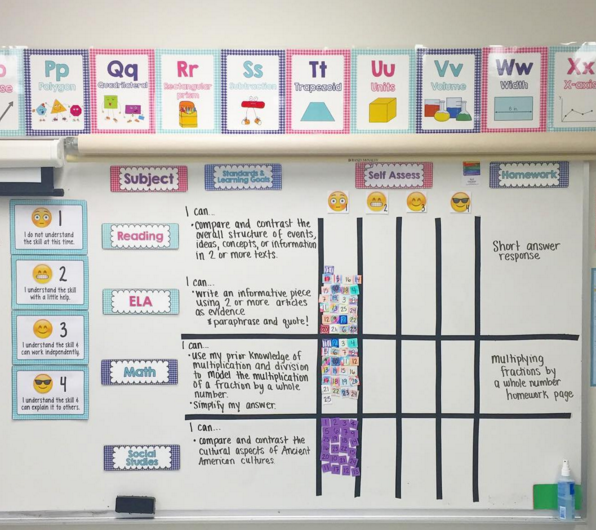 This time, just looking at the emoji posters on the left (1, 2, 3, and 4 cards) and then the emoji rubric grid on the main part of the board. As you can see, the 1, 2, 3, 4 cards on the left are just the explanations of the rubric. Many of us already have these in our classrooms in different forms or wording. Our district has chosen not to use the level 0 at all, so we start at a 1 and end at a 4. Under the "subject" column, I simply have the printable cards of each subject I teach (I teach all but Science). Under the "Standards and Learning Goals" column, I have the goals/standards written out. My students know that on my scale, this would be our level 3 - our goal. If they feel that they have met our goal, then they are a level 3 and that is where they would move their little number card. 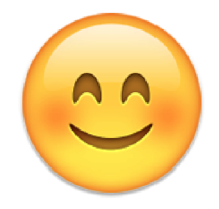 Under the first emoji you will see all of their number cards. I cut 1 inch by 1 inch cardstock cards and the kids simply colored their card with their number on it. I stuck mini sticky magnets I got from Amazon on there, and DONE! Easy as pie! (I did NOT laminate the cardstock because it would make it less likely that it would stick to the adhesive on the magnets - paper sticks better). Before each lesson, we discuss yesterdays goal versus todays goal. For reading, the goal stays the same for days at a time sometimes; however, for math, it changes almost daily. We discuss how we will use these skills in real life and why they are important. We then begin the lesson. Throughout the lessons we do little "temperature checks" where I do some sort of quick assessment to see where my kids are in the lesson. This sometimes is simply visual (on their whiteboards), but it can also be a few multiple choice questions using a program like Plickers (if you don't know this program, you MUST go check it out!). We move our numbers throughout the lesson sometimes, and sometimes we just wait until the end when we change to our next subject. The kids know they may never reach a 4 for a certain skill because I sometimes am not able to assign tasks that bring them to a level four. Sometimes they get level four tasks for homework. Making the idea that a level 3 is right where you want them is very important with this idea. Another important thing is that your classroom environment allows for students to feel comfortable placing themselves at the appropriate level (for example, not to be embarrassed to admit they are a level 1 or 2). This works great in my room, but sometimes it is a big shaky when we start using the scale at the beginning of the year before everyone is comfortable. First thing first - I have not blogged in for....ev...errrrr!!! I have gone completely off the map this year! I feel like this year has not only FLOWN by me, but has been more difficult than ever! Why is this? I don't know why I feel like I have spent this year recreating the wheel for no reason...making things a lot harder for myself than I need to. Anyone else having this problem? We recently had our "big" state writing test. We had been writing non-stop for weeks to prepare for this, so the kids (and the teachers!) were exhausted! As you all know, we can't stop teaching because there is just so much content to teach in one year, but we wanted to give our kids a little brain break to show our appreciation to them for all of their hard work! We decided to figure out a way to turn a popular movie that all of our kids knew into a lesson idea! Analyze how visual and multimedia elements contribute to the meaning, tone, or beauty of a text (e.g., graphic novel, multimedia presentation of fiction, folktale, myth, poem). Discuss the movie, the 5 moods/emotions in the movie, and different examples given in the movie when that specific emotion is shown. 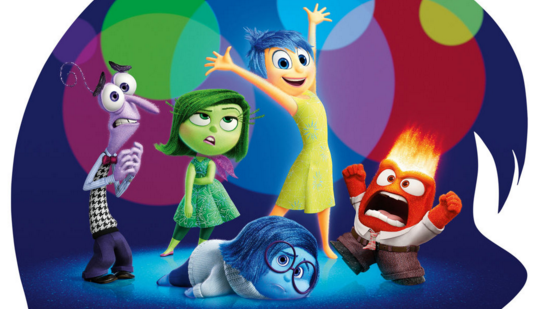 After discussing the above, have the students choose one of the emotions/characters they want to focus on. We are going to write poetry that gives our reader that specific emotion you chose. 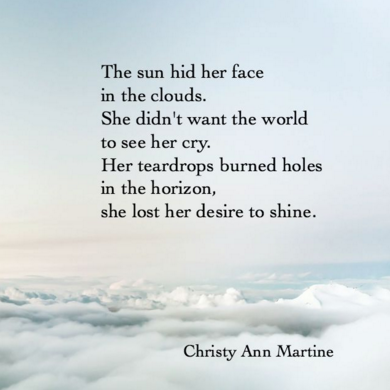 As you can see, the poem does not say "sad", but it is still able to make you feel "sadness". How does the poem do this? Discuss this with the students. 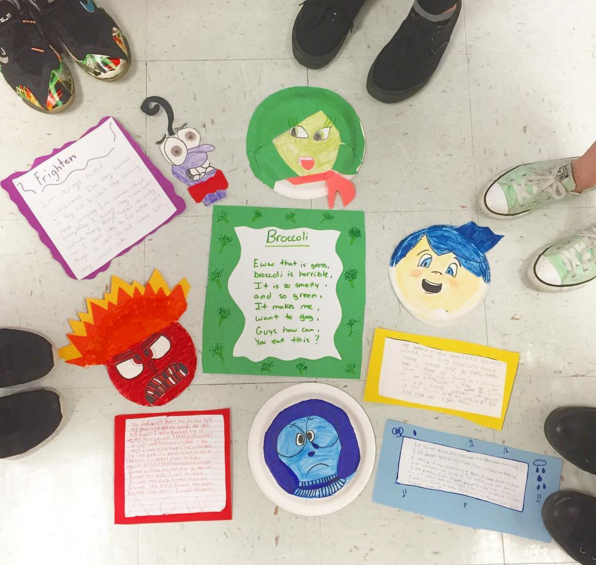 Give each student a paper plate and display the characters from the movie on the board so they can see how they look. The students create a mask using the paper plate and coloring supplies. I told my students that during the time they were making their mask, they are able to think about words that would be useful in their poem. Certain words can give us feeling without directly stating the feeling/emotion. My students had out a sheet of paper on their desk to jot down words that came to mind while they were coloring their masks. When their masks are complete, they write their poem. I gave them an 8 line minimum, but no other rules for rhyming, etc. I was giving them more creative freedom simply because this was supposed to be a mental brain break activity after testing. You may choose to give them more guidelines if you are using this as a more strictly standard based assignment. I was really excited about our end result! The bulletin board came out super cute! I forgot to snap a photo of it, but I will try to remember and add it to this post soon! .✏ Mrs. Stanford's Class ✏.